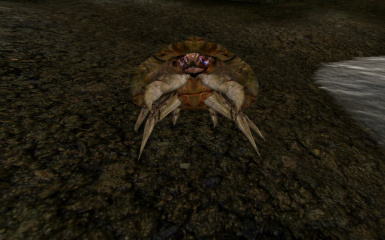 A fixed Mudcrab mesh, reducing distortion and other UV errors. 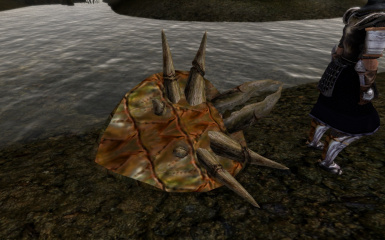 Having seen people complain about retexturing the Mudcrab, I thought I would have a look at the UV mapping, and (like so many Morrowind meshes) it was pretty bad. After a lot of tedious work, I have ended up with a mudcrab mesh with much less distortion and misalignment, but still retains the vanilla look. There is also a minor mesh edit, reducing the size of the "face" section and sinking it into the shell, for a slightly more convincing look. Also included is a prelimary "smoothed" version. It is a relatively minor improvement, and creates some slight (almost unnoticable) distortion, but some people may find it of interest. To install, simply extract the "Data Files" folder from "Regular" into the Morrowind directory, and overwrite any existing meshes. If you want to try the high poly smoothed version, extract the "Data Files" folder from the "Smoothed" folder instead. v1.0 Fixed Mudcrab mesh UVs, beta smoothed meshes. As a simple mesh replacer, this mod this should not significantly conflict with anything, except (obviously) other mesh replacers. Any textures that worked with the vanilla meshes should probably work fine with these. 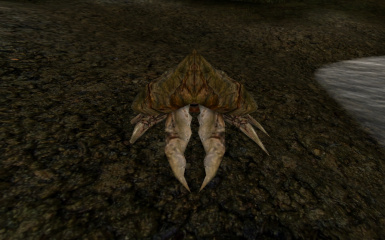 Please report any bugs (with the meshes themselves for example, I haven't completely mastered Blender) to [email protected] or in the [RELz] Correct UV Mudcrab thread at Bethesda Game Studios Forums>Morrowind>Morrowind Mods. Fliggerty: for this style of readme, and all his mods, especially his keyring. Bethesda: for creating a game I love and want to contibute to. And to all the modders who's work makes Morrowind so much richer. Feel free to distribute or modify this as you like in Morrowind mods, remembering that these meshes are derived from Bethesda's meshes. That said, a little credit would be appreciated.